Announcing Our Summer Innovators Program! 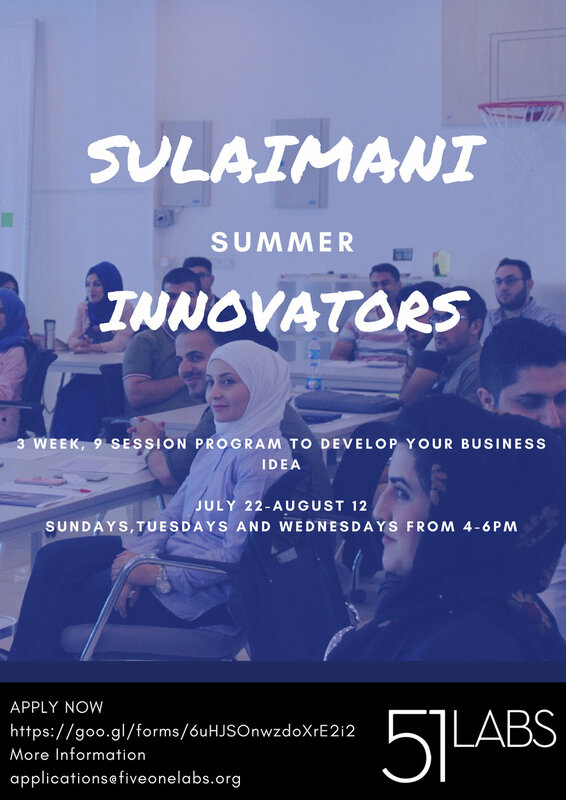 Five One Labs is pleased to announce that we are launching the applications for our first three-week summer program in Sulaimani, Iraq! We are recruiting creative students and young innovators with startup ideas to join our community. If you are passionate about a startup idea and are motivated to make it a reality, this program is right for you! The application is open here and applications are due by Saturday July 7th at 11:59pm. Five One Labs is a startup incubator in the Kurdistan Region of Iraq (KRI) that aims to empower entrepreneurs to build successful businesses. Our first summer program in Sulaimani, Iraq will be held from July 22nd August 12th. Participants are required to attend the training on Sundays, Mondays and Wednesdays from 4pm to 6pm each day. The trainings are held in Five One Labs' brand new Innovation Hub in Sulaimani, opposite of Faruk Group on Salim Street. The Five One Labs summer program is a free, three-week long program for university students and young innovators that takes your business from idea to a reality. Over three weeks, we will teach you the skills to develop an innovative business idea. it's an action-packed, creative program where people learn how to develop and test business ideas, pitch their business, lead organizations or projects, and more. You will go through intensive entrepreneurship, innovation and leadership training, and will be connected to a mentor with whom you will speak each week to obtain extra guidance. Participants who attend 90% of the training sessions and complete all homework assignments will receive a certificate of participation. We are looking for incredible university students or young innovators from diverse backgrounds who have a business idea! All participants must be committed to focusing developing their business over the three weeks (from July 22 to August 12). The expectations are that the individual or the team will come to the co-working space three days a week (Sundays, Tuesdays and Wednesdays) and treat this as their opportunity to understand the business aspect behind their idea with the help of our qualified trainers and mentors. The entrepreneurs will also have a weekly Skype call with a mentor who will guide them through the process of creating a pitch deck. In addition, we strongly prefer teams over individuals, as we believe teams will be more successful in overcoming diverse challenges. Note: if you are applying as a team, each team member should submit a separate application. The information about the start up idea can be the same in the applications of team members. If you are not sure you are eligible or have any other questions, please email us at application@fiveonelabs.org and we will respond immediately! What if we are applying as a team? That’s great! Teams which work well together are more resilient and resourceful. We accept teams of up to 4 people. Each member of your team must complete a separate application form (the information about the startup idea can be the same in all applications). In addition, all team members must be able to commit fully to the three-week program. What if I don’t speak English? Don’t worry, we’ll be running Kurdish and Arabic programming during the summer and in the future! What will our schedule be each week? There will be three training sessions per week at the Five One Labs co-working space in Sulaimani, along with opportunities to put into practice what you learn and to get feedback from your mentors. The program will end with a pitch competition. Over the course of 3 weeks, there will be an entire curriculum that will cover topics related to launching a businesses, such as customer discovery, defining your value proposition, building business models, and strategy, among others.